I recently picked up two new bronzers for the summer 2016 season. 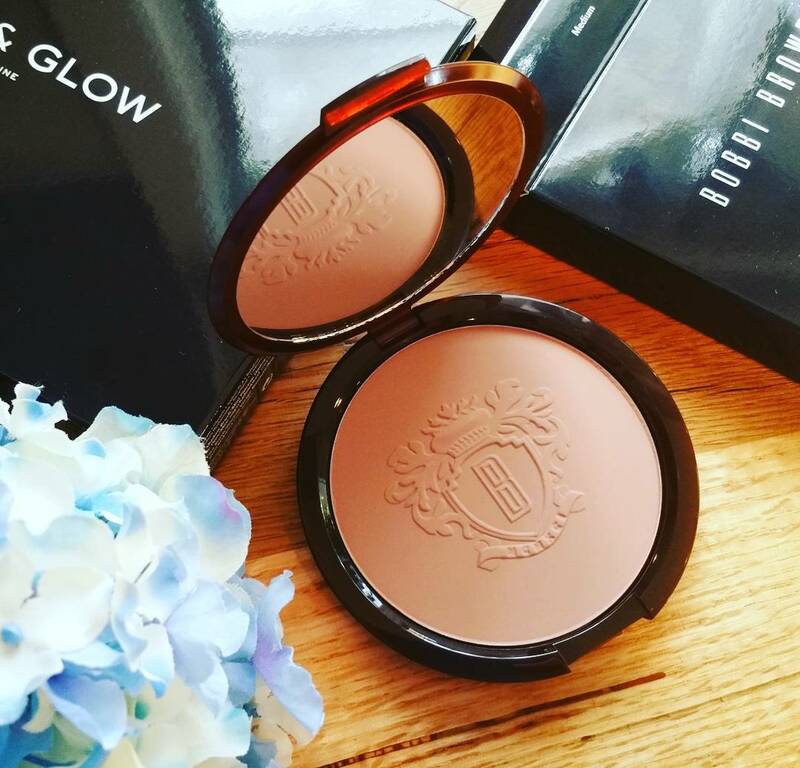 The first one is Bobbi Brown Face & Body Bronzing Powder, which comes in a huge tortoise shell compact. 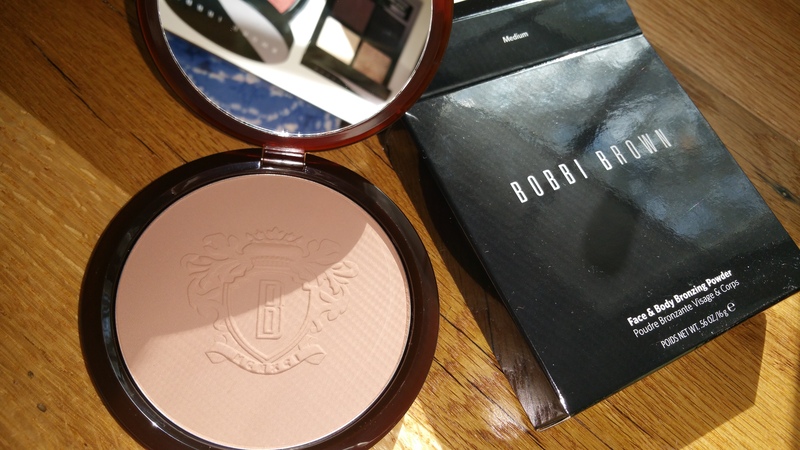 This is a great deal because it’s the same bronzer we love from Bobbi but in a huge size! There are only two colors available in this limited edition bronzer: Medium and Golden Light. It’s $48 for .56 oz. Compare that to Bobbi’s regular sized bronzer which is $42 for .28 oz! I don’t know that I would have chosen Medium over some of the other great colors in the regular sized compact, but it turns out that Medium works perfectly for me after all. It’s a cool bronze that looks incredibly natural on my skin. There are no sparkles or glitter or opalescence. It’s matte, but not the kind of matte that makes you look flat or covered in mud! (See back here for some other matte bronzers reviewed and swatched). During the 20% off Friend and Family that recently ended, I also picked up the Define and Glow Set, which includes a compact with the same, best-selling, Medium Bronzer and a Pink Highlighter, along with a travel sized Angled Face Brush and an Eyeshadow Palette quad. This is a gorgeous set! It’s a good deal at $70. Bobbi Brown Cosmetics Define and Glow Set: Eyeshadow Palette, Bronzer/Highlighter compact, and mini Angled Face Brush. The second bronzer I acquired is from YSL Beauty’s 2016 collection called “Savage Escape,” and it’s the “Les Sahariennes Bronzing Stone” in Color Fire Opal No 2 (Medium). I couldn’t resist buying this one because look at how gorgeous it is. This comes with a signature velveteen pouch as well as a mini flat brush (not that I would use it, when I can instead use a real bronzer brush). At first glance it looks like there are two shades in the compact, but that is an optical illusion: there are sculpted waves (like sand in the desert I guess). This bronzer is interestingly hyped as “silky-matte” by YSL, but you can definitely see shimmer in the bronzer when you open the compact. I don’t consider this to be a matte bronzer, but it turns out that the shimmer isn’t too noticeable either once it’s applied. So it ends up being more of a luminescent type of bronzer. 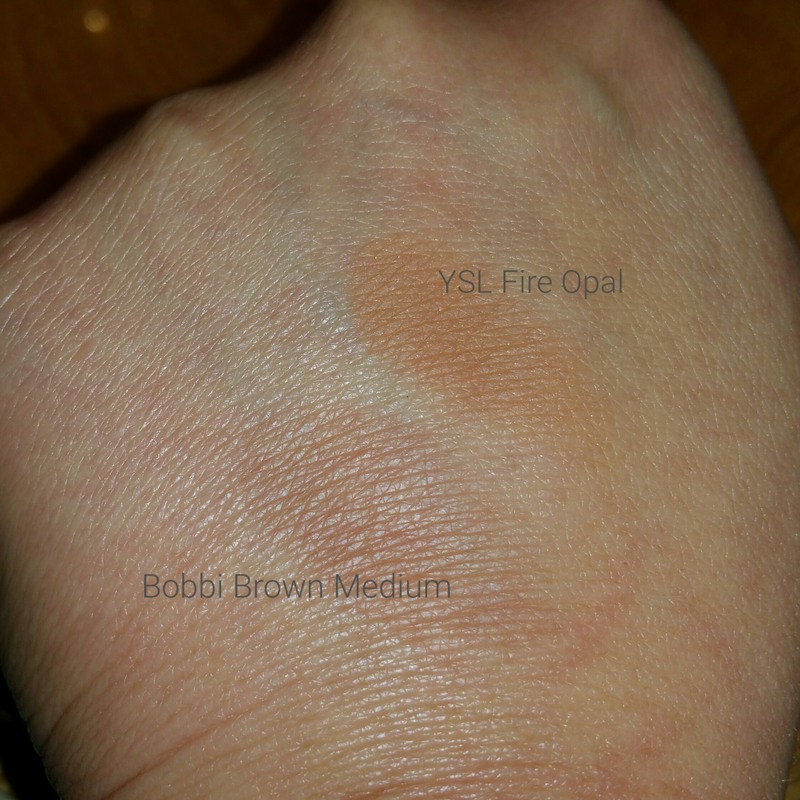 The only problem with this YSL bronzer it is that the color I bought, Fire Opal, is way too warm for me. I don’t think this is neutral bronzer at all, and I don’t think it should be considered the “medium” shade. 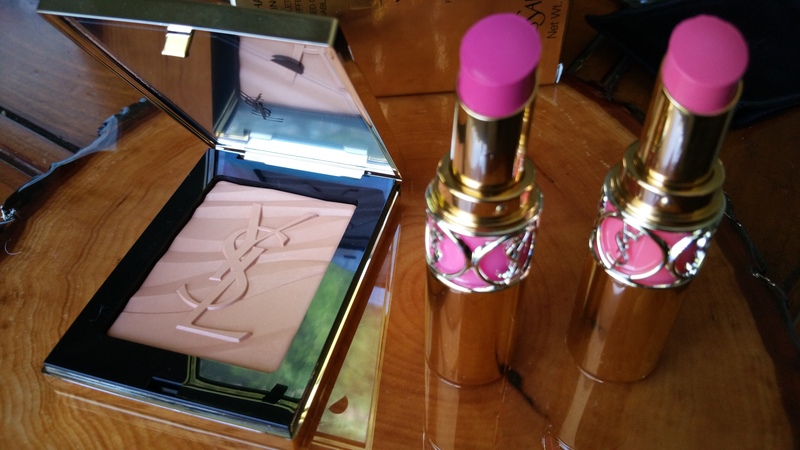 If I were YSL I would clarify the color descriptions to say this is a very yellowish bronze. There are two other shades in the bronzing stones: Sunstone No 1 (Light) and Jasper 03 (Deep), that I haven’t tried. I am not sure I can even pull off wearing the color Fire Opal because it’s such an unnatural looking color on me. I may try to use it on my decolletage if nothing else works. Do you love this season’s bronzers or are you not impressed? Let me know what you think!